The Constellation is a large chandelier for appropriately scaled areas. In even larger areas, they may be grouped across a larger room to increase light distribution and dramatic visual impact. 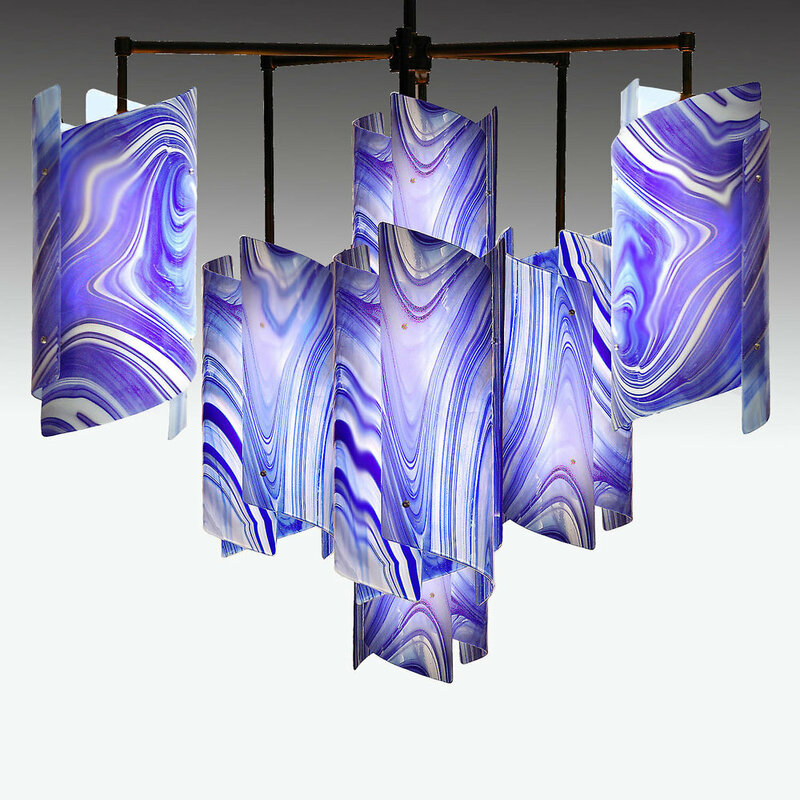 The scale, form and color of these chandeliers is unique. 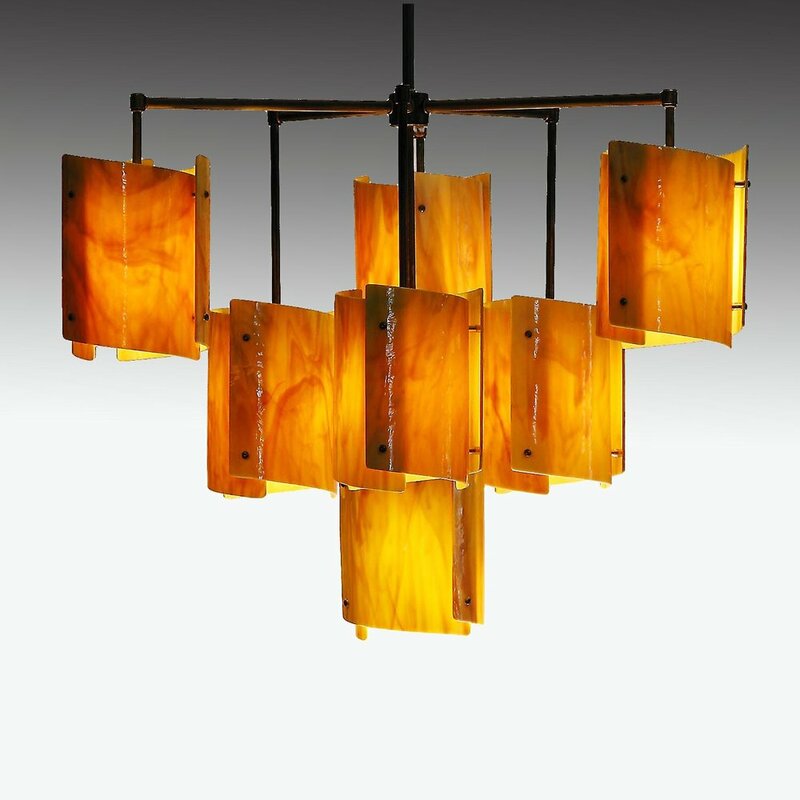 This seven light fixture features three Mini Sushi (or other) pendants on long arms with short drop tubes and three more on shorter arms and longer drop tubes with a central mini-Sushi on the longest drop. This creates a pleasing trilateral symmetry with an added dimension of depth. The tubing shown is oiled bronze. Chrome and brass are other options, either bright or matte. Dimensions: 32" diameter by 24" depth, not including main drop tube (depth may vary depending on the style of pendant selected). $4329 with 3 feet of ½" tubing in chrome, satin chrome, satin brass or dark oiled bronze with matching canopy and articulated hang straight. Custom colors available. Drop tube lengths greater than 3 feet are $15 per additional foot. We need to know the exact measurement from the ceiling to the bottom of the glass so we may cut the tubing to the correct length. Cutting the tubing is best done by us on our machine tools. Check our PDF file for further information on calculating the drop tube length. Mounts on a standard 4" electrical box, all hardware is included. All our lighting carries an Underwriters Laboratories LLC (UL) certification and is so labeled.